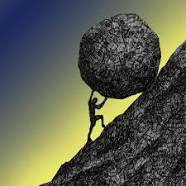 If you know your Greek Mythology, you will recall the tale of Sisyphus, a mortal king doomed to eternally push a boulder up a mountain, only to have it tumble to the bottom each time just before he reaches the peak. Lest this sad fate cause any sympathy to well up, consider that Sisyphus was a greedy lying murderer. I don’t think he’s been featured in any Rick Riordan books yet. His punishment has become an allegory for endlessly pursuing a meaningless, frustrating task. While personal fitness isn’t meaningless (to the extent that any earthly task has meaning), its lifelong pursuit can often be frustrating as we find ourselves looking up at a peak we once occupied. The genesis for this post was my realization that I was writing a fairly detailed response to a question from my friend Nelson about this year’s Boston Marathon. I could have answered his question by simply responding: “10:25 a.m. EDT.” But I’m not that concise. I’m running the Boston Marathon next Monday. I have no pace goal, not even to re-qualify. I do not expect to be able to run under 3:25. I’ve only run 235 miles so far this year due to a nagging issue with my hip. If I want to go back to Boston in 2019, I’ll have to throw down a BQ in a fall tuneup race for the Arkansas Traveller 100. Perhaps I will return to the Heart of America marathon on Labor Day. We’ll see how the spring and summer goes! First, I need to climb back up the fitness mountain. I was at my peak at this time last year coming off a half-marathon PR and hoping for a marathon PR at Boston. Heat deterred me from reaching for that. The break between Wave 1 (10:00 a.m. start time) and Wave 2 (10:25 a.m. start time) is 3:09:36. The break between Wave 2 and Wave 3 (10:50 a.m. start time) is 3:28:48. I was in Wave 1 the first two years I went to Boston. I was in Wave 2 last year and this year. The Wave 1 break is now lower than my marathon PR. This is also my highest bib number (the first with 5 digits), resulting from my qualifying time of 3:16:33 (from last year’s Boston). I’m going to give myself some advice, in hopes that I will take it! The climb is long and difficult. You can’t get back to the peak all at once – not next week, not next month. Don’t increase your mileage too fast. Remember to incorporate strength exercises and stretch after runs. Eat good food. Enjoy the journey. Done right, fitness isn’t punishment. The mountain is ever before us.